Members of the Mount Desert Island Community Sailing Center fall racing team celebrated the end of the season with an intra-squad singlehanded Pumpkin Regatta last Tuesday. From left, Hutchin Gerrish, Kincaid MacCullough, Coach John Macauley, pumpkin winner Chris Booher, Lilly Anderson, Connor Ratcliff, Coach Liana Folger and her dog Sampson. SOUTHWEST HARBOR — Mount Desert Island High School senior Chris Booher took home the “gourd” in the Sailing Center’s annual intra-team Pumpkin Regatta that marks the end of the season. He edged out two-time defending champion MDI junior Connor Ratcliff for the winning score. “We only had five sailors so we made it a single-hand event,” center director Glenn Squires said. Four Turbo 420s were on the line, and a fifth sailor, Lilly Anderson, crewed with a different boat for each race. The strong performance by the club team Oct. 17 at Sail Maine’s Green Wave Regatta in Portland turned out to be their last competition against other squads for the season. A few sailors traveled the following Saturday for the Bulldog Classic, but light winds meant not enough races were completed for results to be official. Team members voted not to travel to the Ghosts and Goblins regatta Oct. 31. 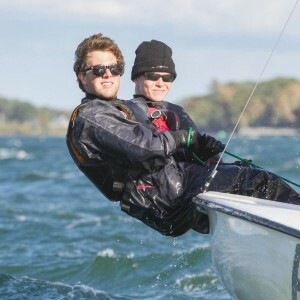 Mount Desert Island High School senior Kevin Elk, left, sails as crew in windy conditions with skipper junior Connor Ratcliff Oct. 17 at the Green Wave Regatta in Portland. Many of the sailors had been on the water consistently since April. They sailed in the spring high school season, summer fleet racing and the fall club team. A few even spent the winter messing around in boats. Booher, Ratcliff and Kevin Elk spent last winter working on Surprise, a Luders that was donated to the sailing center a few years ago. Booher skippered the boat in summer Luders racing. Ratcliff skippered in the fall series, with impressive results. Surprise was third of 13 boats in the summer Sunday series.